Sir Lanka offers amazing natural beauty in a most relaxing environment. If you are a nature lover, besides the beautiful birds, you will find wonderful forests, pristine riparian and waterway habitats, stunning coastlines, fantastic local people, many interesting mammals and great food!! If you are a hiker, you will find great trails through the forests. On this tour we will have two guides; one for birding and one for adventuring so you can choose your activities for the day. This tour does not have a lot of traveling and we will be staying at two locations along the coast, which makes this a very relaxing tour. Stats: 130 mammal species, 508 bird species (33 endemics), 220 reptiles (136 endemics), 121 amphibians (106 endemics), 1389 fish species including 97 fresh water fish and 3,500 identifies plant species. Biodiversity! Depending on your departure city, it will be 2- 3 flights to get to Colombo Bandaranaike International Airport (CMB). Depending on the flights and with the time change, you will arrive 1 -2 days after departure. Your flight should be scheduled to arrive on “Day 1” of the tour and you will be greeted at the airport and a shuttle to the hotel nearby. Colombo is situated on the coast of the Laccadive Sea and there will be opportunities to find some urban and coastal birds, depending on the arrival of your flight. The international airport is located about 20 miles north of Colombo in a city called Negombo and this is where we will be staying for 2-nights. Colombo is the capitol of Sri Lanka and has a population of 5.6 million people in the whole area. Colombo has a large and historic harbor that has made it an important destination for explorers and traders since people first started sailing the seas. Sri Lanka was colonized by the British in 1815 and became independent in 1948. English is a common language spoken by most people. Our lodging will be along the Negombo Lagoon, which is an excellent location for natural beauty and recovery from your flight. Activities for the day are birding, swimming and boating. From Negombo it is a 4-hour drive to the village of Eluwankulam, located next to Wilpattu National Park along the western coast of Sri Lanka. There will be a few culture and birding stops and we will arrive late in the day at Eluwankulam. We will stay for 3-nights at a perfect jungle lodge, call The Backwaters, situated at the edge of a scenic waterway. The list of activities is long and we will have two full days to enjoy everything: Boat Safaris, Jeep Safaris, jungle hikes, bird walks, cycling, swimming, eating great food, night-time exploring and hanging out the friendly staff and meeting new friends, sleeping and doing nothing sometimes. This area is great for wildlife such as the Sri Lankan Leopard, Spotted Deer, Barking Deer, Hanuman Langur, Purple-faced Leaf monkey and Sloth bear. Butterflies and interesting insects are abundant. Day two: “work on” our list of activities. Wilpattu encompasses a diversity of habitats from monsoon forest to grasslands and riparian vegetation. Hence a great variety of resident birds can be seen. During the northern winter, they are supplemented by migrants including ducks and waders and colorful bee-eaters. On a good day during the northern winter, it should be possible to see over a hundred species. Endemic birds to be seen in Wilpattu include the Ceylon Junglefowl, Brown-capped Babbler, Ceylon Wood-Shrike and Black-capped Bulbul in riverine habitats. On the grasslands look out for the Great Thick-knee and Indian Stone-curlew, two nocturnal birds that are ground dwellers. As evening falls, the churring of nightjars greet the night. A boat trip along the uppu aru is another good option for bird watching for riverine birds such as kingfishers and grebes. From Eluwankulam it is a 3-hour drive to our next place of lodging on Mannar Island. Mannar island is located just off the northwest coast and connects to the mainland by a bridge. The climate here is arid and offers different types of habitats and wildlife compared to Eluwankulam. Here we will find mangroves and tropical dry-mixed evergreen forests. There are salt flats, mud flats and natural freshwater pools alongside the saltwater coast and salt marshes; a very diverse landscape. Birds: Long-tailed Shrike, Black Kits, Indian Roller, Hoopoe, Eurasian Spoonbill, Pied Kingfisher, Greater Flamingo, Crested Hawk-Eagle, Crab Plover, Crested Tern, Lesser Golden-backed Woodpecker, White-bellied Sea-Eagle, just to name a few. Over 200 species in total. We will spend 3-nights at The Palmyrah House. 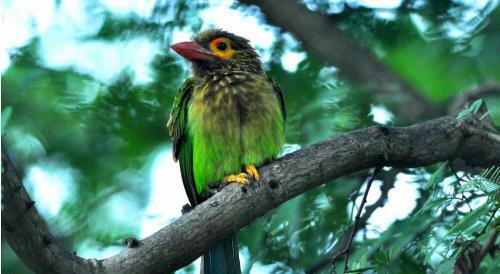 One of the best birding locations in Sri Lanka is the Vankalai Bird Sanctuary where over 20,000 birds spent the winter. This area is also a wildlife reserve and besides birds you will have a chance to see Green Turtles, Salt water Crocodiles, reptiles, amphibians and Dugongs, a rare marine mammal similar to manatee. On the island also reside, Grey Mongoose, feral ponies, Toque Macaques, Grey Langur primates, Indian Pythons and Walking Catfish to name a few of the local residence. Being an island there is an abundance of water activities and sights to see. There are coral reefs for snorkeling and beautiful beaches for long wonderful walks. People have been living on Mannar Island for probably thousands of years and the first known permanent settlement occurred in 543 B.C. This makes for a very interesting history of cultures: Arabs, Persians, Chinese, Romans, Abyssinians, Indians, African slaves, Portuguese, Dutch, British and native peoples. There are historic Hindu and Buddhist temples and catholic shrines from previous centuries. Mannar Island at times has had a tumultuous history, but now a place of peace and unity. From Mannar Island back to Negombo, it is a 6-hour drive. We will try to make the drive as fun as possible with a few interesting stops.